We’re looking for one lucky artist to win and demo the new FreePlay LIVE from Mackie. FreePlay LIVE is the ultra-portable, personal PA of your dreams. With tons of power, crystal clear sound, and up to 15 hours of battery life, FreePlay LIVE is perfect for live gigs, busking, house concerts, and even for rocking out to your favorite playlist. We’re looking for a dynamic artist to demo the new FreePlay LIVE for us and document themselves using the personal PA with behind-the-scenes video and social media updates. 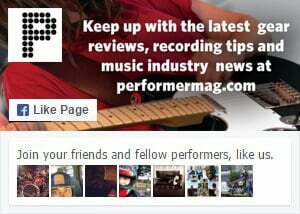 The selected artist will get to keep the FreePlay LIVE and will also be featured in an upcoming issue of Performer. Cool, huh! Scroll down for more detailed info about the new FreePlay Live Personal PA from MACKIE, and good luck! When you need to fill the room with beautiful sound with zero fuss, FreePlay LIVE has you covered. With a professional acoustic design and a high-powered amplifier, FreePlay LIVE delivers crystal clear, natural sound that will take your performance, speech, or music to a whole new level. FreePlay LIVE makes it easy to get set up quickly. Equipped with dual combo TRS/XLR inputs, you can plug in mics, guitars, keyboards, and more, right into FreePlay LIVE. Plus, you can plug in anything with a headphone output directly into the 1/8″ Aux input.